The team explained that graphene tends to not have a bandgap, as compared to standard materials used for photodetection, such as silicon. The bandgap in silicon causes incident light with wavelengths longer than one micron to not be absorbed and thus not detected. In contrast, for graphene, even terahertz light with a wavelength of hundreds of microns can be absorbed and detected. Whereas THz detectors based on graphene have shown promising results so far, none of the detectors so far could beat commercially available detectors in terms of speed and sensitivity. In this study, ICFO researchers Sebastian Castilla and Dr. Bernat Terres, led by ICREA Prof. at ICFO Frank Koppens and former ICFO scientist Dr. Klaas-Jan Tielrooij (now Junior Group Leader at ICN2), in collaboration with scientists from CIC NanoGUNE, NEST (CNR), Nanjing University, Donostia International Physics Center, University of Ioannina and the National Institute for Material Sciences, have been able to overcome these challenges. 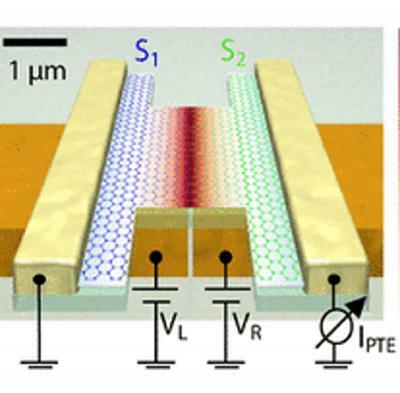 They have developed a novel graphene-enabled photodetector that operates at room temperature, and is highly sensitive, very fast, has a wide dynamic range and covers a broad range of THz frequencies. The results of this study may open a pathway towards the development of a fully digital low-cost camera system. This could be as cheap as the camera inside the smartphone, since such a detector has proven to have a very low power consumption and is fully compatible with CMOS technology.